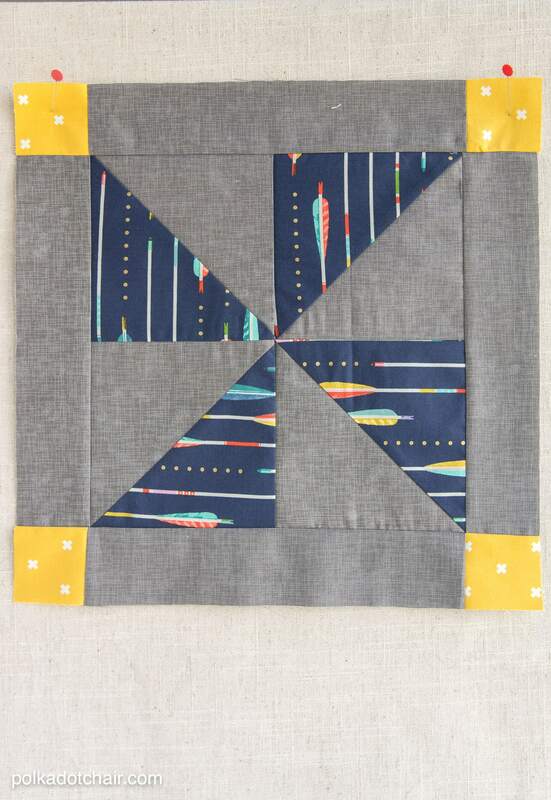 A Modern DIY, Quilt & Sewing Blog. 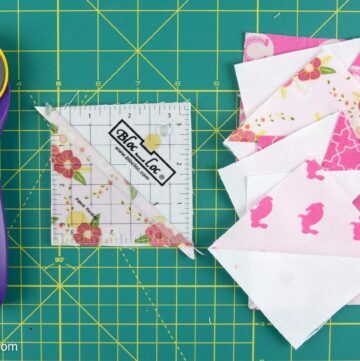 Free tutorials for sewists, quilters and makers! I hope that you’re enjoying stitching along with the “Block of the Month” series here on the Polka Dot Chair! 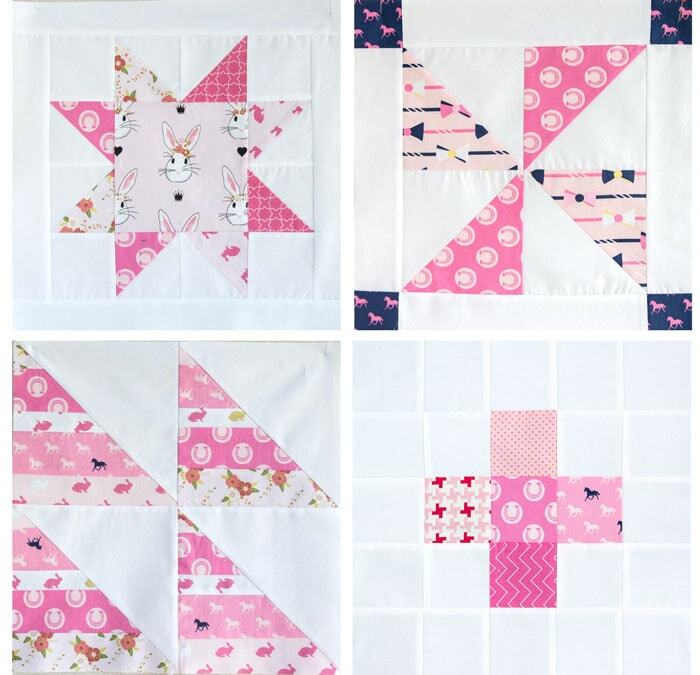 Today I thought I’d share with you a few more quilt block ideas and catch you up a bit on the progress that I’ve made with my personal blocks for the series! To view all the posts in the Block of the Month Series, click here! Hi there! 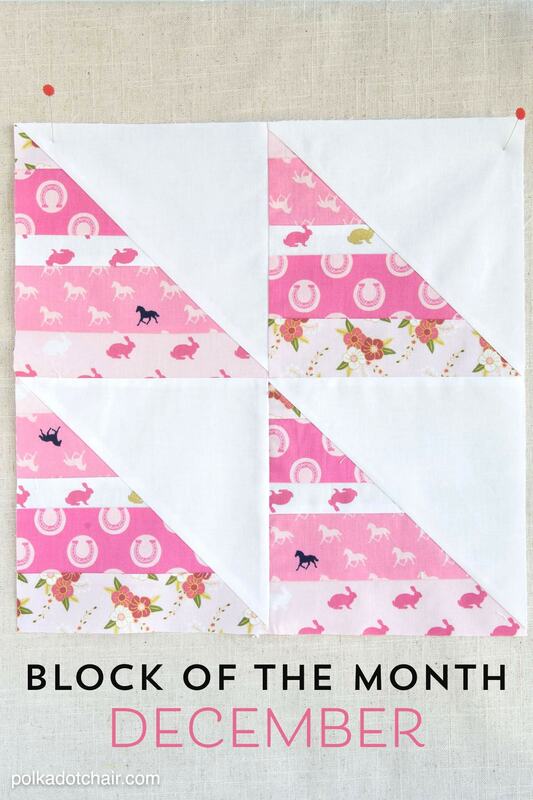 I just wanted to pop in here and chat a bit more about the blocks that I made for the December Block of the Month. I was having some camera trouble after Christmas and only posted illustrations of the December block, now that the issues are resolved I thought I’d share with you a few photos of the finished block. I also wanted to chat a bit about my thought process when designing the block. 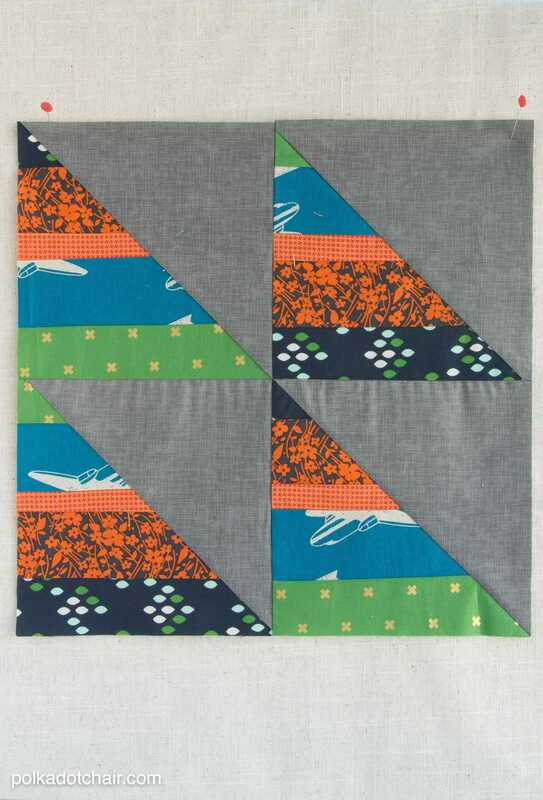 I realized that over the course of the last few years I have picked up quite a few tips for constructing Half Square Triangles (HST’s). Enough I’ve decided, for an entire blog post, so watch for that next week. 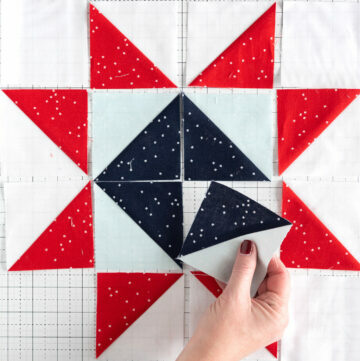 In the meantime if YOU have any tips for stitching HST’s please share them in the comments, I’d love to include a bunch of reader tips (with proper credit) in the post. Okay, now onto the December block. 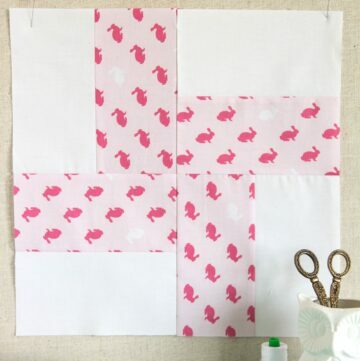 I want the design of the finished quilt to have a good balance of blocks with a lot of negative space and blocks that are visually a bit more heavy. Meaning, not as much background. 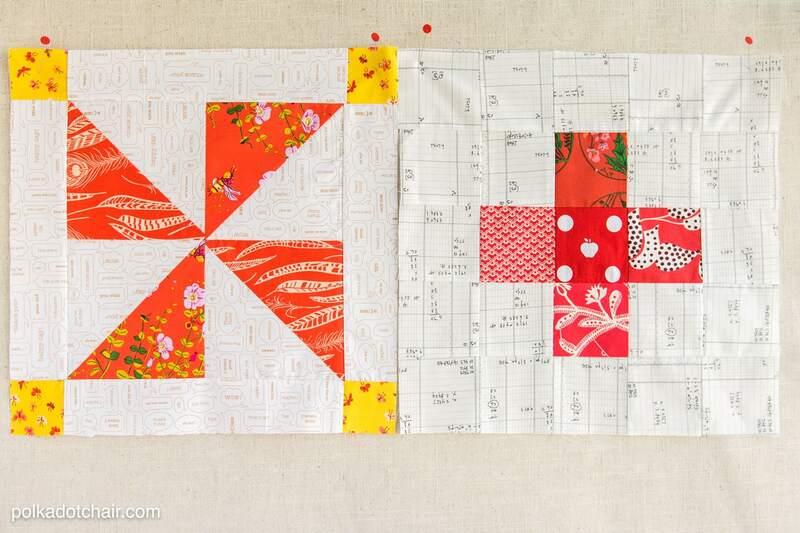 The star and plus blocks had quite a bit of negative space, while the pinwheel block did not. To keep things balanced I designed this block to have more impact and color than some of the previous blocks. I did a little bit of finagling in Photoshop and laid out the quilt a bit so that you can start to get a vision for what it will look like when it’s done. 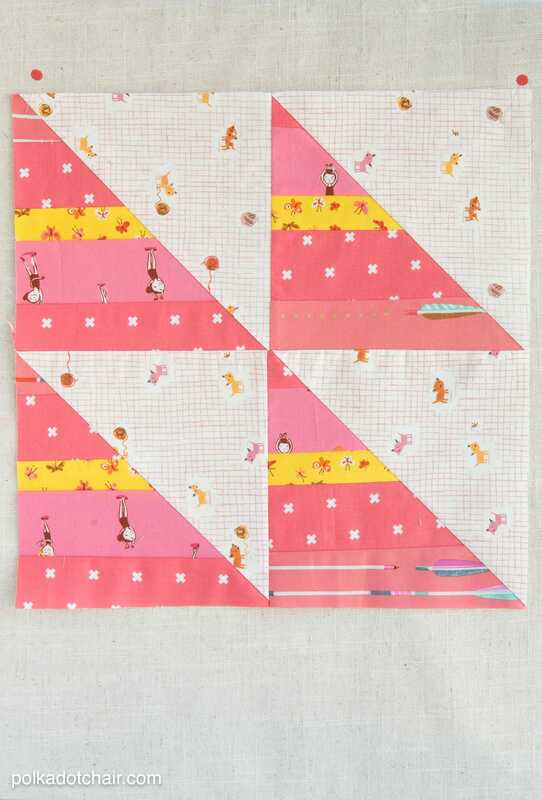 (minus any sashing or cornerstones)… It will be a true sampler quilt, since each block will be unique. 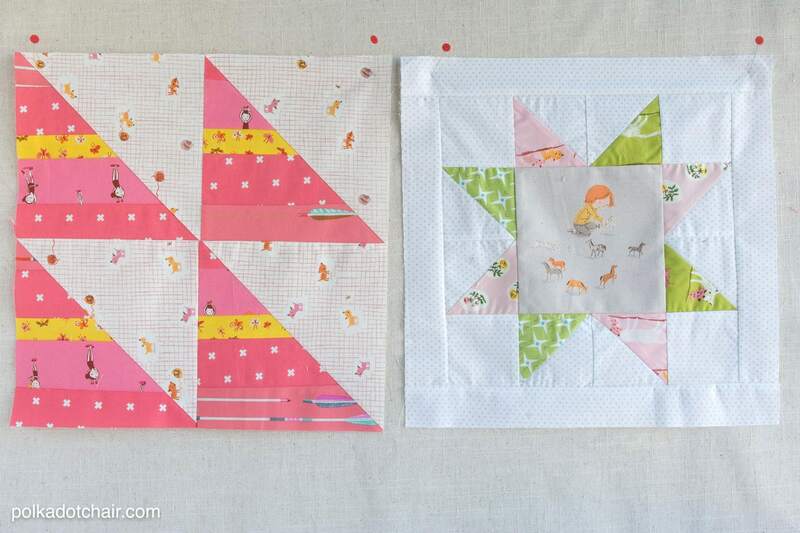 These are blocks from my PINK quilt. I didn’t start out intending it to be mostly pink, but I think it’s going that way and I kinda like it, so I’m just sticking with it. Do you recognize the bunnies in the blocks? 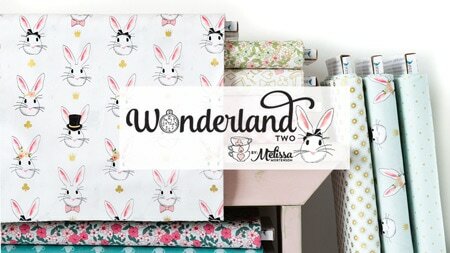 Those are from Wonderland, I am cutting up the strike off sample fabric and using it everywhere I get the chance! 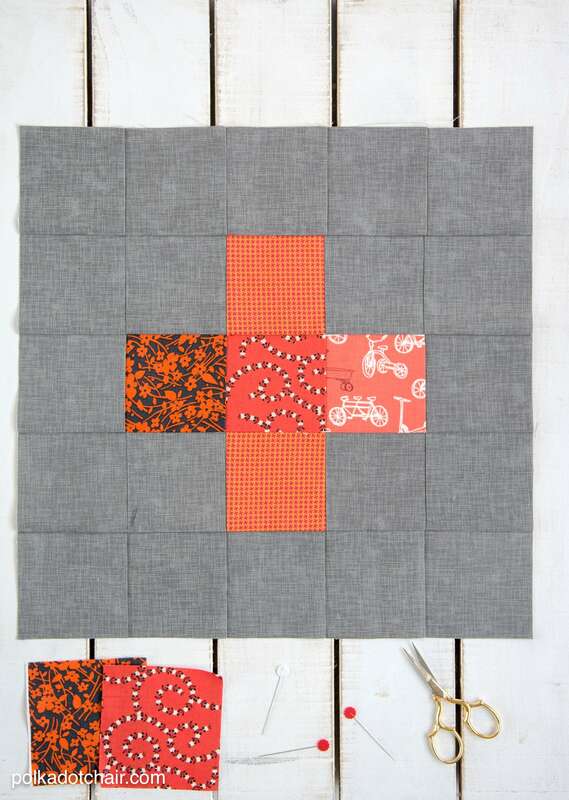 This block, as well as the next one I’ll show you, are a monochromatic color scheme. The fabrics I selected were all variations of the same color. For the block for my “low volume background” quilt I added a strip of yellow just to break it up a bit. 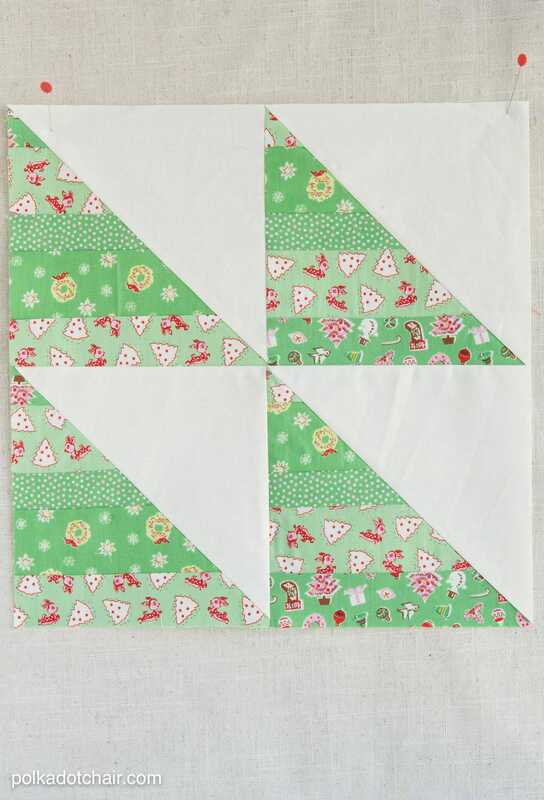 Here is another monochromatic block, stitched up in all green fabrics. 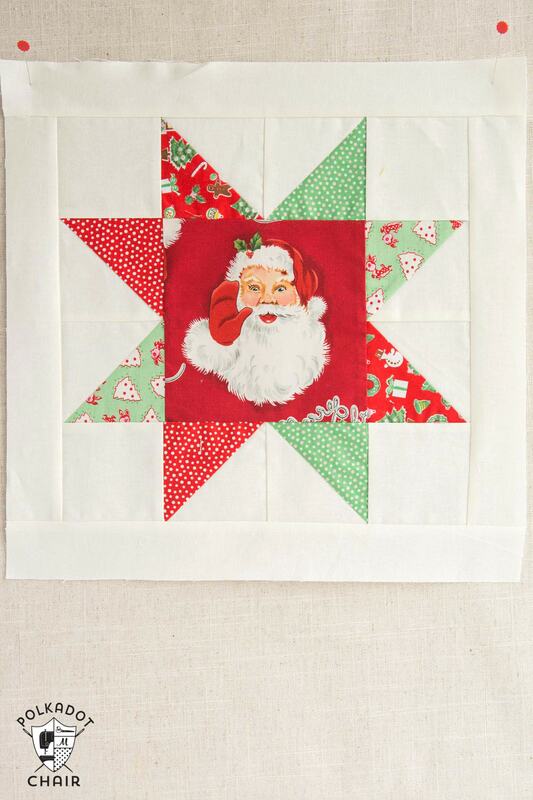 It’s a block from my Christmas quilt. 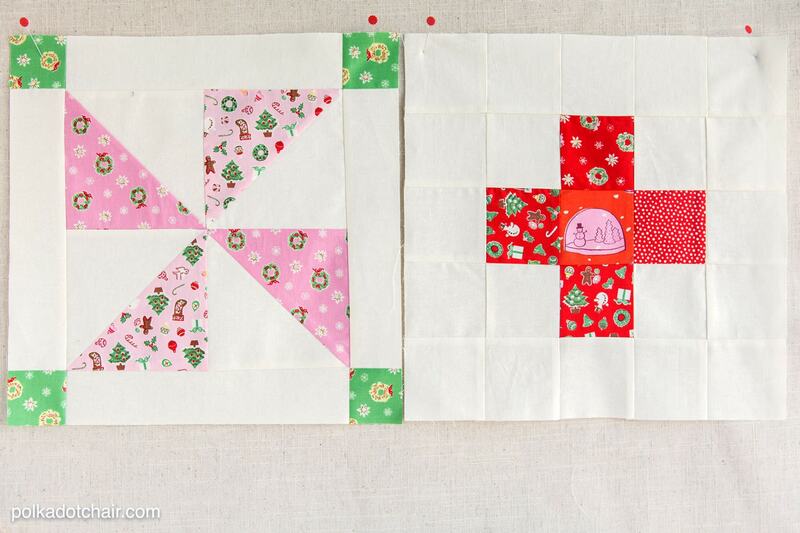 I am debating about stopping this quilt at 9 blocks, we will have to see how the year progresses before I decide. So far it’s turning out to be one of my favorites. For the block for my teenage sons quilt I decided instead of a monochromatic color scheme, to make them intentionally different colors. I thought about it a bit like creating my own striped fabric. I love how the orange and navy’s are working together and so far my son approves (fingers crossed that continues). I hope that you’re enjoying making the blocks. I’ve been doing my best to answer all of your questions as they come in via email, facebook and the blog. Feel free to leave questions in the comments section, I’ll answer them there, then everyone will have the benefit of an answer! We are now 1/3 of the way done!! If you’re behind, don’t stress!!! The blocks are all pretty simple and you should be able to catch up quickly! 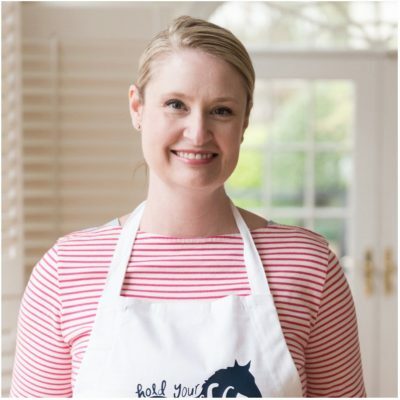 Melissa Mortenson is the author of the Polka Dot Chair blog which has been sharing fresh and creative ideas with readers since 2008. She is the author of “Project Teen, Handmade Gifts your Teen will Actually Love”. 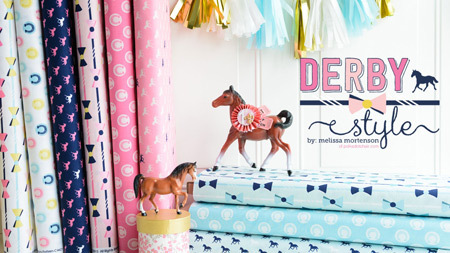 Her work and designs have been featured on numerous websites including HuffPost, Today, Pioneer Woman & BuzzFeed. 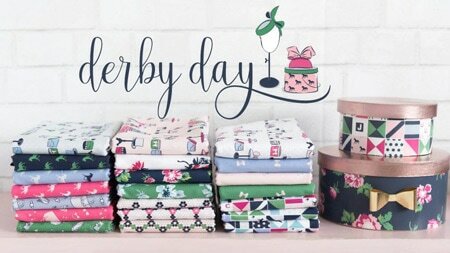 Her first fabric line “Derby Style” debuted in January 2015 through Riley Blake Designs. It was followed by 7 other fabric lines in subsequent years. A mom of 3, she considers herself lucky to be living in Kentucky. Thank you for doing these block posts and showing the different colorways. They all are charming! 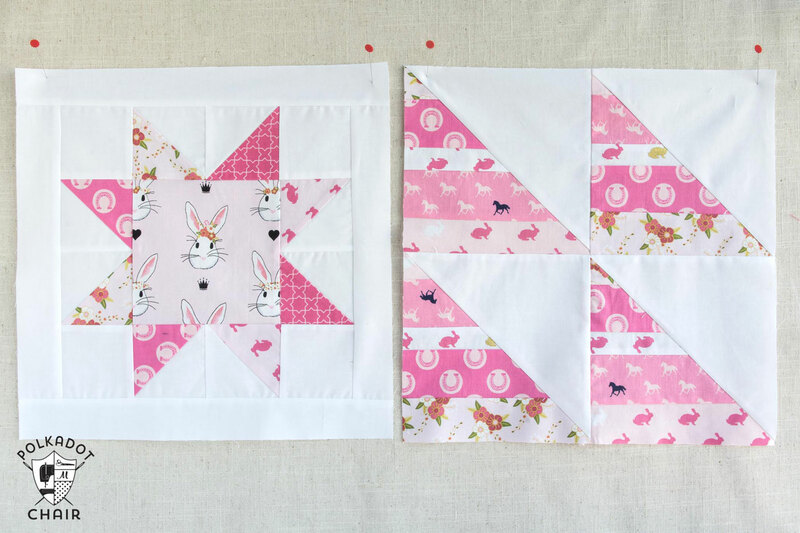 My favorite is the pink blocks with the bunnies, so cute! Thank you!! That pink one is turning out to be one of my favorite also! Hello! It’s nice to meet you. I’m Melissa. Mom of 3. Maker. Fabric Designer. Adventurer. Thanks for spending part of your day with me. Find out more about me here. Fresh Ideas delivered right to your inbox! 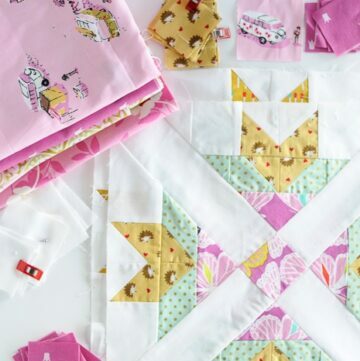 Start your free subscription today and you'll also get access to all of our subscriber exclusive free printables & patterns! All my images are copyrighted. If you would like to feature my work, you may use ONE (1) NON-COLLAGED image and must link back to my original blog post. You may NOT edit, crop, or change my images in any way without written permission. You MAY NOT print out or copy and distribute any text, images or patterns from this site. All patterns, content, instructions and templates are for personal use ONLY! Thank you! The privacy of visitors to polkadotchair.com is important to us. While every effort has been made to ensure the accuracy of the content on this website, the information is made available without warranty of any kind. The Polka Dot Chair accepts no responsibility or liability, whether direct or indirect, as to the currency or accuracy of the information, nor any consequence of its uses. This website is not intended to substitute the advice of a professional. This website frequently uses affiliate links. 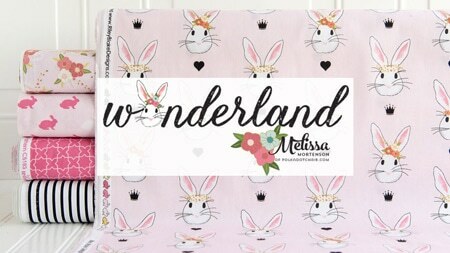 Melissa Mortenson is a “creative mama”, published Author, Licensed Fabric Designer and the founder of the Polka Dot Chair blog. The Polka Dot Chair is a place for Creative Moms and Families to come to find simple and inspiring DIY projects for their home, sewing projects, Holiday crafts, and family recipes. Its mission is to make its readers WANT to create. The Polka Dot Chair is a participant in the Amazon Services LLC Associates Program, an affiliate advertising program designed to provide a means for sites to earn advertising fees by advertising and linking to amazon.com. For full disclosures please see the About page.